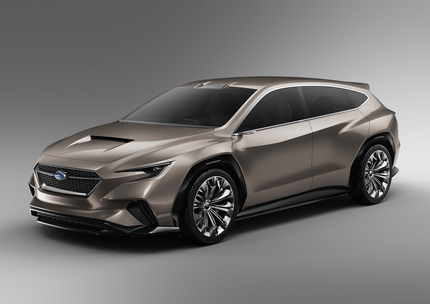 The 88th Geneva International Motor Show played host to one of Subaru’s latest vehicle concept reveals — the VIZIV Tourer Concept. The newest VIZIV Concept features the automaker’s dedication to increasing the joy of driving as well as engineering their vehicles with the most advanced safety technologies. It follows the blueprint of Subaru’s signature touring wagons, exemplifying Subaru’s “Dynamic x Solid” design beliefs. The VIZIV Tourer Concept boasts a hexagonal grille, four chiseled fenders, and a spacious body. Inside, the concept delivers seating for four and ample cargo space. “The VIZIV Tourer Concept is filled with a crossover mix of values to enhance active lifestyles, expressing the enjoyment and peace of mind that Subaru delivers to its customers,” reports Subaru. Equipped with the latest in safety tech to “reduce driver fatigue on long journeys,” the VIZIV Tourer Concept features the “next-generation EyeSight system” complimented by additional driver-assist technologies. “Designed with a tourer theme, the Subaru VIZIV Tourer Concept unites a Symmetrical AWD layout powered by a boxer engine, with Subaru’s wealth of expertise in offering driving performance, practicality and safety; delivering a new value in a tourer form, enabling drivers and passengers to fully savor the enjoyment of travelling by car,” explains Subaru. Although the VIZIV Tourer Concept made quite an impression at the auto show, Motor Trend writer Collin Woodard is more interested in what the VIZIV Tourer Concept means for the WRX wagon. The first Subaru VIZIV Concept was introduced to the world in 2013.